15.05.2013 Available on DVD through www.umbrellaent.com.au In Nazi-occupied Poland during World War II, poor Jewish café owner Jakob Heym (Oscar®-winner Robin Williams Best Supporting Actor, 1997, Good Will Hunting) accidentally overhears a forbidden radio news bulletin signaling Soviet military successes against German forces. To combat the overwhelming depression that pervades the ghetto, Jakob invents fictitious news bulletins about Allied advances against the Nazis. These lies keep hope and humor alive among the ghetto inhabitants—spirits are lifted, hearts are refreshed, and optimism is reborn. The Germans learn of the mythical radio and begin a search for the resistance hero who dares operate it. (July 21, 1951 – August 11, 2014) was an American actor and stand-up comedian. Rising to fame with his role as the alien Mork in the TV series Mork & Mindy (1978–1982), Williams went on to establish a successful career in both stand-up comedy and feature film acting. His film career included such acclaimed films as The World According to Garp (1982), Good Morning, Vietnam (1987), Dead Poets Society (1989), Awakenings (1990), The Fisher King (1991), and Good Will Hunting (1997), as well as financial successes such as Popeye (1980), Hook (1991), Aladdin (1992), Mrs. Doubtfire (1993), Jumanji (1995), The Birdcage(1996), Night at the Museum (2006), and Happy Feet (2006). He also appeared in the video "Don't Worry, Be Happy" by Bobby McFerrin. 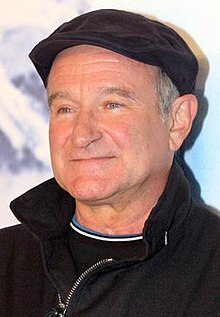 Nominated for the Academy Award for Best Actor three times, Williams received the Academy Award for Best Supporting Actor for his performance in Good Will Hunting. He also received two Emmy Awards, four Golden Globe Awards, two Screen Actors Guild Awardsand five Grammy Awards. Tags: Clip of the Day and Robin Williams.